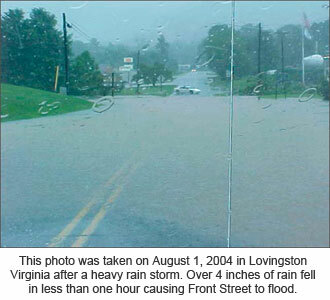 Flash flooding can occur in or near mountainous areas, on small streams and even in large cities. Water levels can suddenly rise in heavy rainstorms, leaving little time before small streams and drainage ditches become raging rivers. Sometimes a flash flood can unleash its deadly force in just a few minutes. Police and fire department barricades are there for your protection. DO NOT drive around them. Flood waters covering roads or bridges have more force and power than you might think. Your local Emergency Manager can assist you with creating your disaster plan and answer your questions about disaster preparedness in your area. Feel free to contact the Nelson County Department of Emergency Services to assist with any questions you may have on disaster preparedness.